The classic-gaming-as-viable-business landscape looks wildly different from its form a decade ago. Where retrogaming fans once had to make do with Nintendo's haphazard Virtual Console release schedule and an occasional dribble of retro compilations, today we have something approaching an embarrassment of riches: Mini-arcade cabinets of all sizes; Arcade Archives; a revival of massive anthologies produced to higher standards than in previous generations; brand-new games for vintage consoles; and painstakingly recreated high-end facsimiles of the old machines themselves. Whether you want to throw together a cheap piracy box to play ill-gotten NES ROMs or construct a bespoke retro corner of original hardware adapted to run on modern televisions, the business of old games has become nearly as lively a facet of the industry as making new ones. Speaking as someone whose work has drifted into the 'bespoke original hardware setup' area at considerable personal cost, effort, and frustration, I've grown increasingly interested in solutions that can provide authentic retro game experiences without the pain involved in getting, say, a triple-decker Sega Genesis "tower of power" or Virtual Boy set up to run in high-definition on contemporary TVs. There's certainly something to be said for using the real thing, but frankly, if I were to embark on my journey to build an HD retro capture setup today, I'd have taken a radically different approach than I did when I started five years ago. At the time, field-programmable gate array devices like Analogue's Mega Sg and the open-source MiSTer project didn't exist, emulation-based plug-and-play solutions like the RetroN 5 were a far cry from good enough, and PC-based emulation didn't play well with television output and video capture devices. For a proper and satisfying retro experience, you simply had to go with original hardware... not to mention all the hassles their ageing capacitors and inconsistent technical standards brought with them. So when I say that the enigmatic Polymega retro console system caught my attention when it was announced in 2017, you can understand where I'm coming from. Polymega stood out for its sleek modular design, which made it look like a grown-up cousin to the Retro Freak system, and for its bold promise to operate on a hybrid FPGA / emulation setup. To this point, retro systems have used one approach or the other, either reproducing classic consoles dynamically at the hardware level with an FPGA or else handling games directly in software through emulation. Promising support for (deep breath) NES, SNES, Genesis, Sega CD, Saturn, PlayStation, PC Engine and PC Engine CD-ROM – as well as all of the related regional derivatives of those platforms – the concept seemed almost too good to be true... which in fact turned out to be the case. The Polymega as it exists now is simply a standard PC-style core running a suite of customized emulators; FPGA modules have been mooted, but for now, we're talking exclusively software-based emulation. While the news of this tech shift came as a disappointment to many FPGA enthusiasts, software emulation isn't automatically inferior to hardware simulation. Polymega, it turns out, runs several of the best emulators currently available, some of which have been customized (with the cooperation of the original emulator creators) for the system. For example, its Sega Saturn core appears to be a tweaked version of Mednafen. The Saturn demos I went hands-on with recently at Game Developers Conference 2019 certainly ran well, which bodes well for Polymega, given the Saturn's famously finicky internals. 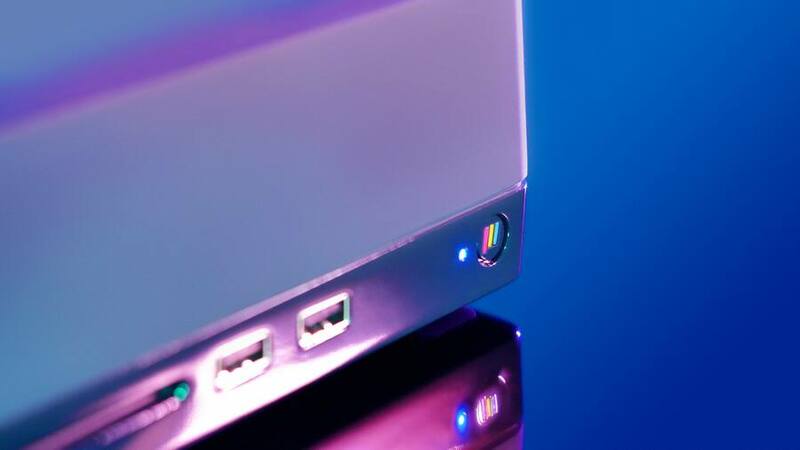 The Polymega admittedly suffers from a few software quirks that need to be ironed out before it launches (which could be as soon as this summer, according to manufacturer Playmaji). The most notable of these was a bit of stuttering that accompanied the Neo Geo CD title I tested. I was told this was a temporary side effect of the console's disc caching process, and indeed the game we demoed – one of the Sengoku titles – did settle down and play more smoothly after a few minutes. The disc-based games also take a while (roughly 10 seconds) to spin up at launch, which isn't a deal-breaker but can be slightly annoying. And the front-end interface feels a little clunky to learn, especially when you start dealing with imported discs that reverse their confirm and cancel inputs from their western counterparts (the process of swapping between discs for multi-disc games, in particular, is a bit prickly). 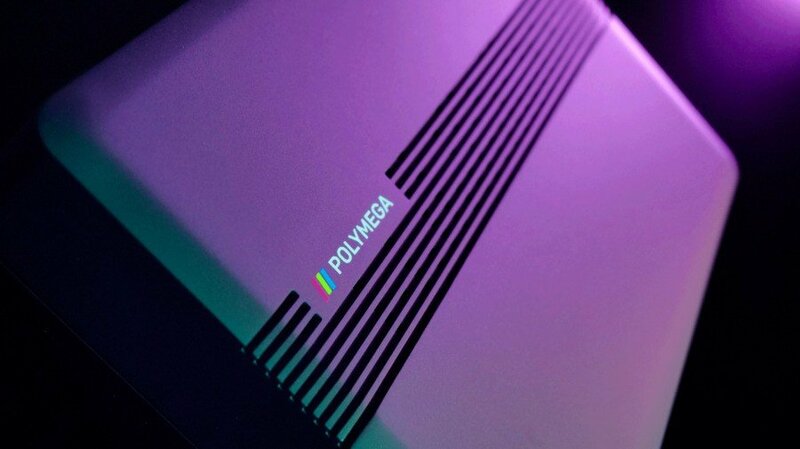 Polymega could also stand to see a few more filtering and display options; it includes three, ranging from simulated composite video degradation to pure crispy pixel perfection, but the selection feels anaemic compared to the suite of display features available in contemporary classic reissues by the likes of M2, Hamster, and Backbone. Despite these issues, though, I came away from my hour-long demo impressed by the Polymega system. My session showcased the system's support for advanced, disc-based 32-bit consoles and 16-bit add-ons – devices not effectively covered by existing commercial multi-system emulation boxes like RetroN 5 and Retro Freak. The only significant technical snag I noticed was the aforementioned Neo Geo CD caching issue, and that was balanced (at least in part) by the fact that the first level of Sengoku loaded in about two seconds, considerably less time than it took on the notoriously sluggish single-speed CD drive of the original console. Otherwise, the setup ran games smoothly across a range of formats and styles, with solid frame rates and responsive control input. I tested several games, perhaps most notably Fighters Megamix for Sega Saturn, which ran at a smooth 60fps throughout according to the (optional) on-screen frame count. On the strictly 2D side, the first couple stages of Dungeons & Dragons: Shadow of Mystara ran without a hitch in two-player mode, despite the original game requiring a RAM expansion cartridge when played on Saturn. Also impressive on a technical level (if not particularly compelling on the gameplay front) was the brief trip I took through Fahrenheit for Sega 32X CD, which is one of the few games not supported by Analogue's impressive Mega Sg. The complex add-on processor and mandatory analog hookups the 32X required make it difficult to emulate that peripheral in standalone hardware, but that's less of a hurdle for a pure emulator to clear – not that much of anyone is clamouring to play the six dreadful titles that comprise the 32X CD library. Still, it's a neat party trick. Perhaps the most interesting aspect of Polymega is found in the way in which its modular design correlates to its creators' desire to 'play nice' with game publishers. Unlike many emulation boxes, Polymega requires the use of original media in order to run. You can't simply load up an SD card with a complete ROM pack and have instant access to the thousands of games all the Polymega’s supported consoles can run. Instead, it works more like an actual console: You need to insert a game's actual cartridge or disc in order to play it (though in the case of systems like Sega CD, which lacked copy protection, a 'back-up' copy of the disc will suffice). The add-on platform modules, which are sold separately from the base unit, exist primarily as a conduit for the different cartridge formats used by various older consoles. While this adds an element of inconvenience and encumbrance to the Polymega, I get the impression its creators have adopted this approach to embrace legitimacy and improve their odds of retail distribution. While emulation and software piracy tend to be somewhat synonymous in the eyes of many gamers, they're not the same, and Polymega is designed around the idea of 'proper' emulation that doesn't infringe on anyone's copyrights. By presenting it as a way to revisit players' existing software libraries rather than launch into a buffet of torrented ROMs, Polymega manufacturer Playmaji distinguishes itself from all those sketchy mall kiosks of bygone days. The interchangeable console modules serve a second purpose as well: In addition to a cartridge interface, they also contain 'zero lag' controller ports for the controllers belonging to the system in question. That said, the modules aren't a mandatory constant. While the Polymega doesn't support loading games from ROM files, it does offer a backup feature that allows you to dump your discs and carts to add-on storage (the demo unit I tested had been equipped with a massive solid-state drive, loaded with an enormous library of games). Once dumped, a game no longer requires its corresponding console modules... unless, of course, you'd prefer to play it with the intended controller rather than the all-purpose pad included with the hardware. The default Polymega console itself supports all disc-based platforms, and only disc-based platforms, right out of the box. The base of the unit is a flat, low-profile device that contains the disc drive and internals of the system. The forward two-thirds of the unit upper portion is, by default, simply a hollow plastic cover that can be removed to allow the various cartridge modules to slide onto the drive unit and connect to the dock at the system's rear. I didn't really have a chance to experiment with the swappable modules, so I can't speak for how well they do their thing, but I did take a brief tour of the 'backed up' games installed on the demo unit, and they cover a solid range of obvious platforms ranging from NES to Genesis / Mega Drive. Even Master System games should be accessible with the use of the Genesis' Power Base Converter, I’m told. Noticeably absent from Polymega's exhaustive list of supported games: Anything handheld. This is strictly being positioned as a console emulator, with the potential for a handheld variant down the road. This does, unfortunately, appear to mean that Super Game Boy support isn't included, since the emulator hasn't been given the ability to recognize the individual Game Boy carts. On the other hand, it supports console titles from all regions on each platform, and it includes support for NEC's various Turbo CD System Cards. There's plenty about Polymega that remains to be seen. Since I didn't experiment with the cartridge modules, I didn't get to test-drive its support for esoteric enhanced carts like Yoshi's Island (Super NES), Virtua Racing (Genesis), and Akumajou Densetsu (Famicom). The games I demoed ran smoothly and accurately, outside of the Neo Geo CD caching, but as I didn't have any of my own disc-based titles on hand we ran through games selected from a set of (I would estimate) around 100 that had been curated by Playmaji. Inevitably, a device that potentially supports as many games as this can't realistically be fully QA-tested for every possible game; when something inevitably breaks, how quickly will Playmaji move to patch those issues via its wireless internet connection? Details like this will ultimately determine the value and longevity of the system. These uncertainties aside, I found my reservations about Polymega were largely cleared away by my test session with the system. Certainly, it does an impressive job of handling some rather difficult consoles, and the way it embraces legitimate emulation (both in terms of support for original media and its authorized use of existing emulators) while still allowing players to boot their own backups seems like smart business. While Polymega's final form isn't quite what we were promised at first, it's shaping up to be a satisfying take on the TV emulation box, with better performance and greater ambition than currently available multi-platform console emulators... not to mention the promise of continued versatility and expansion down the line. It's definitely one to keep an eye on, especially for players looking to graduate beyond the standard 16-bit platforms that represent the extent of other emulator boxes' support. Blimey! I spend enough money on current gen games as it is. If I buy one of these I might as well declare insolvency right now! Fantastic concept though, I hope it does well. Well it's good to know if someone outside was able to play this. Was wondering if it was turning into a vapor console. If it's real then it's sounding better than the (new) Atari VCS, which is not sounding good at all. Talk of this thing usually boils down to someone saying "just get a raspberry pi!" because they don't understand the appeal of something like this at all, but I do and I'm very intrigued. If they can deliver (everything sounds promising so far) it would be a pretty great way to keep my retro collection alive and well. .........or just buy a cheap Sega Saturn from eBay!!! Thinking about the sound expansion Famicom carts... I suppose that is a bit different if this device is using the cartridge solely as a storage device. Even if the cheap NoaC Famiclone I had (before I busted it) could (sort of) play the one sound-expansion cart I had at the time (Digital Devil Story Megami Tensei II). It played the extended sound but at a surely-incorrect volume balance. I would guess that the NoaC would only need to emulate audio in/out and let the real chip create the sound itself. Whereas if Polymega is only cart for loading/identifying the ROM and running it through an emulator, it would need to emulate the sound chip as well. So, about 2 years delayed form their initial release date, we now have a series of emulator boxes that don't work completely well yet. We still don't even know if they have working cartridge ports/disc drives/modules as they only had a 100 game list to choose from of games already loaded to the drive at GDC, and even some of those had caching/stuttering issues? For all we know, this could be RetroArch running in a custom frontend. It may not be "vaporware" but it's seeming more and more like the vapor has merely been contained in an expensive plastic box. Oh look, an emulator box. We haven't had those before. Besides supporting original controllers via the modules and the included controller, does this support any other controllers, like say an Xbox One controller? I could only find one on their channel (the one you linked), as well as another from stitched together Instagram stories from Jeremy Parrish's time playing these games. As we've seen in the past with previous retro console scams, you can run video of your fake UI transitioning into gameplay footage easily, or "rehearse" it in other ways. We can't get a good look at how this thing is even hooked up. Simply put, these guys have a history of being flakey on what their console actually is, while at the same time calling out legitimate manufacturers like Analogue. I wouldn't trust these people until an actual, real unit is out in people's hands, and given their track record, I'm not holding my breath. So let's give a big front page of NL welcome to the Coleco Chameleon 2. @SmaMan Some of that is certainly fair, which is exactly why I bailed out in their first round of preorders last year. At that point they'd showed next to nothing and I wasn't on board. They've gotten a lot more transparent at least. They have some way to go, certainly, but the absolute disdain and conspiracy posts from some people (not you and not here necessarily) are a bit much. Like I said, I'm very intrigued and always waiting to see more. What's the big deal about emulating from the legit discs? No, no other retro knockoff does it, but I was doing it on my PC years ago. With a free emulator. They act like it's the first time any machine has been able to do it, ever. It's just another knockoff retro console with software emulation like all the others that happens to have a CD drive. Seriously don't get the hype. Who is even the target for this? People paying buttloads of money for rare games aren't generally skimping on the hardware it's supposed to run on and this seems very overpriced for casuals. And there's things like the Everdrive that you could use on this to load up an SD card with ROMs easily enough. So, they can forget that when they think it's for legit use only since there's already a way around it. They lost me when they changed their design from HARDWARE emulation to SOFTWARE emulation. I'm surprised at people complaining about this console. It's for collectors and people who want an authentic feel of playing classic games. If that's not you and you prefer to buy a Pi with a bunch of illegal games, have fun with that. I refuse to support a product from a company who was a total d-bag on Twitter to people who had the audacity to ask about FPGA console. What a bunch of morons. @Rodan2000 90% chance it`s not working. I'm so happy you guys gave that to @JeremyParish. Now that you've got your hands on him, we just have to wait for Nintendo to publish more retro goodness, and we're in for a treat. @JeremyParish Did they give you any word on the BIOS situation? They've been very dodgy about this question, and they can't legally ship the official, copyrighted BIOSes that most of these consoles (especially the disk-based ones featured here) require. @Godzil No good for Saturn, Mednafen which they're using needs a decent spec to run well, Pi cannot provide this. 16 bit Pi can do no problems mind. Praise the gods of Retro! @JeremyParish Great to see you here on Nintendolife! Retronauts is great. And I love my Flipgrip. There's no way to really know how good this thing is until it goes through some rigorous testing. The problem with emulators is not the easy games, it's the hard games to emulate that are the real test. It would be all to easy to hand pick the games that work to give the impression that it works flawlessly. It is admittedly funny to see a retro gamer complaining about hooking up retro consoles when they still make TVs with composite video hookups. Although I gave up on retronaughts when ps3 gamers were considered retro, half the episodes cover anime or tv shows and have nothing to do with games, they whine about systems like the genesis just because they didn't grow up with it, and you can count on some ignorant political injection that has no place in the discussion every few episodes. @subpopz What you were doing on your PC years ago is kind of irrelevant, though. Like you said, it's new to a box like this. Also, i guess in a way I am the target for this. The idea of having a more modern way to play my old games is appealing. Yes, I am aware it is emulation, but if I can hook it up to a modern TV and pop in all my turbo CD and PC engine CD games while I keep my turbo duo in the spare room on the old CRT, then it is yet another convenient way to play and manage my games, and I think that's all it needs to be. And if you are saying this thing is going to support everdrives, it isn't They have confirmed that. How can you possibly know it will work as well? Have yourself tested the Polymega? A Raspberry Pi is an incredibly low power device. To emulate the Saturn at full speed requires at the very minimum a system on the level of an Nvidia Shield, and even then there will be countless performance issues, and masses of lag. If you want to set up a Pi and stuff it with stolen ROMs then go ahead, it's clear the Polymega isn't designed for you. @subpopz Name a plug and play box which runs original Saturn games for under £300. I have a real Saturn but it's in another room on my PC monitor via a Framemeister. To me the appeal of this is to bring my Saturn collection to my TV with minimal hassle and crucially as little lag as possible. Ever emulator I've ever tried as an insane amount of lag, so if they can solve that I'll be impressed. And it doesn't support Everdrives. @ramu-chan @Thesharkfromjaws It won't support Everdrive or a device like it in the same way Blu-ray was proclaimed to be piracy proof. Such bold claims never amount to anything, and if anything provoke others into proving them wrong. If this thing does what it claims to do, someone will have it running ROMs and ISOs pretty quickly. If people are hacking new consoles to do it, this thing doesn't stand a chance. Besides, 'does not support' Everdrive, doesn't mean actively preventing it either, which is all their site says on it. @SmaMan They say they have integrated BIOS for the CD based systems, but you can use an illegal one they say you have to get yourself. They're against illegal ROMs, but fine with illegal BIOS, lol. Ever since a couple of con artists put a SNES Mini in a Jaguar shell and called it a revolutionary new retro FPGA game console, I think we've all earned the right to be skeptical. @ramu-chan to be fair if it's so hard to emulate a saturn, even on modern high powered computers what are the chances these guys suddenly solved all the problems almost overnight? The same people who had to give up entirely on the FPGA idea and resort to just a normal computer stuffed with mostly off the shelf software emulators? They didn't have the skills to implement FPGA but can solve all the problems with software emulators. I have been waiting for this thing for years!!! I needs this so I don't have to have 10 consoles hooked up! @SmaMan There's skeptical, as in being cautious with good, well-founded reasons, and then there's the criticism aimed at this concept, which is highly over-exaggerated. By now, there's dozens of videos, lots of communication and information coming from the team behind it, confirmation about it being a thing from several people, among which the people who's emulators are used (in cooperation with these very people, as described in the article here), but no matter how many videos are posted or how many (rather positive) articles are written about it, people still rather hysterically keep shouting fake, every chance they get, without having any decent proof themselves of it being so, other than pointing at other failed attempts at making such devices. Look, I'm just as annoyed as all the other people who were looking forward to a machine/concept finally promising pin-point emulation by way of FPGA, or a combination of FPGA and software, but apparently, they've managed to iron out most of the problems, reportedly with help of the developers of these emulators themselves. So I'm still willing to give them a chance and wait and see what they'll ultimately come up with, instead of already condemning them without any proof whatsoever, other than looking at other failed efforts, which are totally unrelated, other than being in the same industry, but they have nothing to do with Polymega, or the team of people behind it. @Yorumi Well, if what the writer of the article says is true, and they managed to improve emulation with help of the creators of these emulators themselves, then perhaps there might actually be a chance that they're more than decent enough. @ThanosReXXX my main concern is that they've already failed to deliver on one promise, and did that fake saturn video, the current promises seem a bit outrageous. They're basically promising near perfect emulators of systems that to this day don't have perfect emulators. I would like it if it turns out to be real just because the CD systems it emulates are ludicrously expensive so it is a good solution for that problem. That hinges on the emulators being HIGHLY accurate. I would say to within 95-100% accurate. Any test in a controlled environment isn't going to inform us of the accuracy of the emulators because it would be easy to just put the games that work well on there. Until we see it in an uncontrolled environment we're not going to know. I would argue there's enough controversy surrounding the developers to warrant the criticism though. @subpopz I think it's pretty safe to say that any Everdrive cartridge will work just fine with this device, seeing as the Everdrive is designed with being used on original hardware in mind, so unless they come up with some kind of built-in software routine to prevent that from working, I think you might be right. @Yorumi Some criticism, yes. And that's also a healthy stance to take, in general. But the negativity concerning the Polymega is getting ridiculous. Let's just assume that they did indeed contact/contract/pay the maker of the Saturn emulator, and that he did actually manage to improve the emulator. Why wouldn't that be an option? @Rodan2000 And deal with the watch battery that runs out in 2 years, a flimsy aging disc drive thats getting more and more dying units these days, a cart slot that brakes easily, and spend extra on the regional switcher (The import cart breaks the cart slot if you're not careful) and/or either a mod for HDMI or some upscaler. As good of a library it had, the console itself was not designed very well. Stick to selling us on Analogue products, please. Those deliver on their promises and then some, and deserve this sort of coverage. So far Polymega hasn't done a thing to convince the community they'll live up to even half their promises, have been caught in numerous lies, have backtracked on their stated intentions several times, have engaged in a foolish smear campaign against Analogue, and have downright attempted to scam us. @ThanosReXXX Thanks for being the voice of reason here. The evidence, to me, speaks for itself; these guys are working hard to make Polymega a success and Jeremy's positive impressions reaffirm that in my mind. @Thesharkfromjaws You can hook a modern PC up to your TV and play your games from discs using the exact same emulators. This product offers nothing. @Kriven "This product offers nothing" For you? okay. Don't buy it then. @ThanosReXXX It's possible of course. Actually I hope it's happened and they actually do deliver highly accurate emulators. If it works I'd love to get the base unity and a pc engine model. I just also think what they're getting from people is kind of deserved. It's probably a waste of time to say the scam type stuff in comments but like I say the devs haven't exactly handled this well either. Sorry, I don't support butthurt loser companies who bash other companies because they can't deliver promises made. But the sycophants are gonna sycophant. N64 and I am in. Their critism of Analogue was very silly. I rather like the Retron 5 and that already exists, I have a modded multi region Saturn and a PS3 that plays PS1 games. I'll wait and see when this thing actually appears as to whether it's any good and worth owning. I think it looks like a good product... but a particularly niche one. It's clearly not the best solution for playing 8 or 16 bit cartridge games. For those the FPGA machines from Analogue are the gold standard and there are plug-and-play mini-consoles with much cheaper emulation boxes that read original cartridges in-between. Polymega is neither fish nor fowl there. For playing 32 bit CD based games though it's a good solution. There aren't many (if any) cheap off the shelf devices that do that job well. Yes you can do it on a decent PC but that's a bigger cost and not the convenience that this device promises. To my knowledge there aren't any FPGA consoles that emulate those systems perfectly in hardware at present. Of course, how many people actually have a worthwhile collection of early CD games and how many early CD games hold up is a different question and that's what severely limits the target audience for this device. Still, best of luck to them! @Damo You're welcome. Seems to me like it's the only logical stance to take, since we as consumers just don't have enough information and/or evidence to decide either way, so I'd still prefer to keep an open mind about this. PlayStation Doom--still the best all round version of the game imo. Sony should have included it on the PlayStation Classic. The Polymega is looking like a really solid modern-retro console. Are madnafen and kega fusion the same thing? As I’m sure it was announced they use an updated by the creator 64 bit version of kega fusion for all Sega emulation below Dreamcast. Looking at the vids they’ve released I’m pleasantly surprised by the quality of Saturn emulation. @ThanosReXXX you have wonderful teeth. @Dawve30 Kega is dead, pretty sure Steve Snake works for Microsoft or something. Sounds amazing. Looks gorgeous. Have been waiting quite a while for this now though. Will it ever actually be released? I checked it is the first 64 bit update of kega by the creator. They announced it on their twitter feed. @Thesharkfromjaws No, lmao. It literally offers zero advantage over other products on the market, the original hardware, or a laptop/desktop computer. It's an expensive, superfluous hunk of plastic. The idea of an all-in-one retrobox is incredible and tempting, especially if it came with composite output for that true SD experience, but if all the box is doing is using off-the-web emulators--and requiring that you use twenty-year-old cartridges and discs (which are largely dying)--it doesn't have a purpose. You are better served by other existing products. I'm impressed that this emulates 32x. Pretty much all of the clone consoles out there don't even try to emulate it. Even though I don't own a lot of 32x games, it will be great to play those games in HD. I am tempted by this. I hope it works well particularly on Saturn games. I do wish I could play/buy other games so I'm excited by the prospect of an online store too. I'd be shocked if the everdrive worked with it. It hasn't worked with any other emulator box such as the Retron 5. The reason is that an emulator box is typically looking for a ROM to pull into the machine and play itself. The everdrive itself is an FPGA which requires the hardware to interact with it before it provides the specific ROM which is to be played. Software emulation doesn't interact with carts the way real hardware does. This thing paradoxically makes me think both that it's making really big promises, and yet not quite delivering what I would want. The website proudly boasts supporting over 30 systems! Wow! What a deal! But in reality that is not really the case. It supports about 7 systems and their various add-ons and peripherals and the international versions of the same system. I don't really think it is right to consider Playstation NA, Playstation Pal and Playstation Japan as 3 different systems, for example. And what it doesn't support kills it for me personally. No N64, Game Boy/GBA which are the systems I would most want to see on a device like this along with the Mega Drive, Playstation, SNES, NES and the Sega machines. You are apparently the "voice of reason", yet aren't even aware that Polymega themselves have stated that Everdrives won't work on their machine. Do you really know anything about this product at all? Or just basing your thoughts on wishful thinking? I could emulate software on my computer. Why would I fork out money on something I could already do, if I chose to do so. Not interested. NintendoLife is really angling hard for that free demo unit! Anyone know how this gets around needing the BIOS files? Do they have official licenses? This article read like an ad for Polymega. I didn't make it half way through before having flashbacks of old video game magazines like EGM and Gamepro where this stuff happened (ads that looked and read just like an article). Long story short, buyer beware. @ThanosReXXX That's assuming that an NDA (Non Disclosure Agreement) wasn't signed. I would love it if this thing gets released and it's worth every penny. If that happens, I will buy one however considering what a horrible job they've been doing marketing this, I'll keep my wallet closed for the time being. Find a way to run roms and I'm in. Sadly classic media is at a point where it's all failing and games are no longer playable from the original carts and discs. I get what they're going for, but roms are just practical. Although it's nice that you can play and backup original media, if you do have it. The individual and extra components for all Cart based systems sounds very costly. Honestly a straight up console-type unabashed emulation box that just does literally everything PS2/GC and earlier would really be ideal. I've read and heard a lot of hate for Polymega after what was considered an FPGA "bait-and-switch." Personally, I'm very pleased that the company made a choice to go with the achievable instead of the utopian with this console. Going with licensed emulators meant they could focus on components, cases, and a decent frontend-- still plenty to do with only $600k in preorders. Getting away from FPGA also means getting to highlight disc-based 32-bit titles that Analogue and friends can't manage yet. I'd be especially pleased to have a version of Sega Saturn that doesn't lose sync with my HDTV every 30 seconds. All this said, I do have some reservations about this console. I'm not wild about the "module" concept, for one. Where the heck would I put these things? If I buy this I'll probably get a Turbografx module and stop there. I was also disappointed with the system's handling of tricky 480i titles like Virtua Fighter 2. If this machine can launch without a need for daily updates, and can live offline for the most part, I'll probably be sold. @ouroborous I'd like to point out that I've never had a cart or CD stop playing, nor do I ever hear of this. Ok but there was literally an article on nlife recently about systems dying from age. And it's also true that physical media, cart or disc ultimately has a limited lifespan of use, no matter the degree of preservation. CDs go bad eventually. Look it up. Carts dryrot basically. @Galgomite I have to agree. I read the recent article at NL, and I always knew that all this stuff ultimately has a limited lifespan, but I have a comparatively large collection of retro game hardware and software and I’ve never had a single issue. Disks are said to be more prone to eventual disk rot if they already have scratches but mine are pristine. I know that all this stuff will eventually die, but I have a feeling that most of it will probably easily outlive me. I take care to keep it all at a low humidity (40-45%), which should help. NintendoLife has a history of getting behind projects/games that never come to fruition. This could very well be another one. Awesome article by Jeremy. I love the fact that these FPGA based systems will make consoles immortal in a sense, and respect the idea of playing them on HDTVs, but I’m one of those that love to play on a CRT with original hardware. I just can’t get on with the super pixelated or strongly scanlined look of games on a flat panel that these superb units by Analogue and others put out. The shadow mask/aperture grill of CRTs are much more complex than these machines are capable of reproducing and even the commendable PC efforts still can’t replicate the real feel of a good, low-use CRT, with its unique glow and vibrancy. As I say, I respect all methods to play these old games, but for me, putting that cartridge into a genuine original console on one of my CRTs gives the game session a genuine sense of occasion and excitement that I can’t get anywhere else. Read it again. This isn't an FPGA system. Definitely interested in the Polymega purely for the Saturn support, so I'm really hoping it works as well as the previews suggest. I've got a fairly extensive Saturn collection but the discs have a shelf life and I've had a few start to fail on me, so the idea of backing them up to an SSD with accurate emulation sounds very enticing indeed. But - I think I'm going to wait until the first units are out in the wild before I take the plunge. @KennyBania I understand the excitement (and also all of the concerns) surrounding the Polymega. 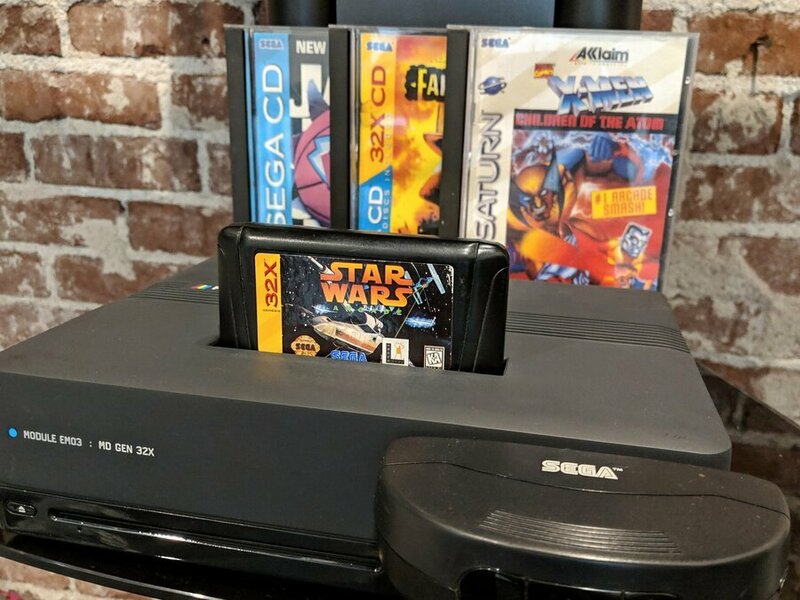 I was at one point head over heals for this system (specifically for Sega CD and Saturn games) but the way the company has been acting has raised way too many red flags. I have a feeling if this does indeed get released, it's going to lose support and die. The people behind it are going to get rich and disappear. Just another investment scam. @ouroborous That simply isn't true. I have hundreds of original carts and discs and have never had a single failure. Not one. I'm sure some are failing somewhere, but based on my own personal experience such failures are extraordinarily rare. @Painkiller_Mike This article was written by Jeremy Parish. If you don't know who that is, look him up. He's pretty much THE expert on retro gaming. To call him a shill is extremely disrespectful. @Yorumi Well let's see. They claim they've been working directly with the emulator authors to perfect things and they're claiming 99% Saturn compatibility. Looking at their gameplay videos so far (which largely come from Twitter suggestions) I'm not seeing any inaccuracies. Time will tell. Supposedly Kevtris is working an a DAC video converter which would allow his fpga models to output an analogue signal and play games like duck hunt on a crt with no lag. @ramu-chan I actually went back and read the article in its entirety after I posted and I will admit it did get better and he appeared to be honest about the system (he pointed several negative things), I still stand by my comment. It still reads like an ad. And for the record, I never called him a shill, nor did I imply that he was one. That's the interpretation that you got from my comment and I won't apologize for that. @ramu-chan They've made many claims, a number of them untrue. @KennyBania I’m aware l that this is a hybrid, of course. I’m really bunching this in with the FPGA systems when I say this - i.e. as opposed to the bottom of the barrel type emulation boxes. @cleveland124 that would be great - he’s a prolific guy! @Deanster101 I do, don't I? @cleveland124 Interesting. Didn't know that. Also, a bit of a bummer, then. I'm interested in the Polymega, but not in hunting down ancient 8 and 16 bit cartridges, so I'll have to wait and see, then. @KennyBania Thanks for that wonderfully positive reply. Your fellow NLife member that I answered right before you, at least made a far more decent effort. And yes, I've read enough info on the Polymega in general, just not about the Everdrive bit. Guess I wrongfully assumed that because it can run original cartridges, that it should also be able to use Everdrives, but thanks to @cleveland124's explanation, I stand corrected. My bad, then. @Painkiller_Mike Same here. Sound thinking, and a good example of healthy skepticism. I'll also keep an eye on them, and like you, I hope they pull it off. Either way, they'll really have to make an effort to openly showcase the various modules to the general audience, perhaps this year's E3 might be the ticket to do that. At least that way, we can get some more assurance on the thing actually working as it's supposed to, as well as getting some more hands on reports from various media. @andykara2003 It's not hybrid though, there's no FPGA in this at all. They're even going to release the nes and snes modules as pure software emulation and maybe, sometime down the road, release an FPGA version of individual modules. It's just running mostly off the shelf pc emulators with some tweaks. "And yes, I've read enough info on the Polymega in general, just not about the Everdrive bit." @KennyBania Well, then that's something that they must have added later, probably due to many requests/questions from potential buyers, because initially, that was not mentioned in the FAQ. On a side note: I got most of my info from their forum pages and YouTube channel. I don't really use FAQ's as my go to, seeing as I often have more questions than just the standard ones found in those FAQ's. @Yorumi Yes, I see they've now removed this - it was going to be a feature. Still, it doesn't make a difference to what I was saying, FPGA or not, real hardware plus CRT can never be beaten for me - although I respect all (edit:most) options of course, which have their place. Oh wow, so with this I can actually play 32X games! It is great news considering how the original hardware is notoriously unreliable. Whoa Jeremy Parish wrote this? If this is the caliber of writer now doing articles here I'm going to be wayyyyyyy more polite and happy! its a con will never see light day was supposed be out years ago then changes changes and more changes. Like atari VCS will neve be seen. Wouldnt belive these con men if they told be it was sunny outside Id still take an umbrella.